A way to radically reduce the cost of building a velomobile by using the Open Source system. Starting with a typical recumbent trike (tadpole type) you add a fibre reinforced plastic shell that you can make yourself from a mould which you have borrowed at no charge from another hypertrike.org member. Members are encouraged to copy the moulds and improve the design as they go which then passes on others who want to make their own Hypertrike. 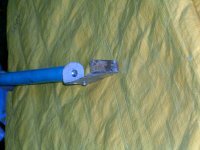 Cost for materials by those who use their own (free) labour is about 200 EUR (Ozzie $320, US $240) for fibreglass, polyster resin, rigid PU foam etc. more detail here!. 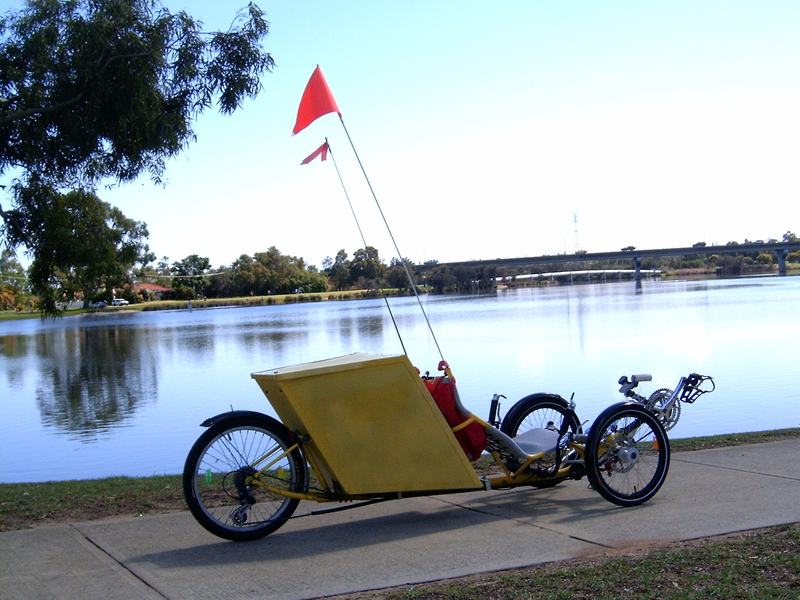 The chassis of the prototype is a stretched version of a Logo trike but the aim is for the shell to be applicable to as many tadpole trikes as possible by way of simple changes as part of the basic design. You can even build your own sports trike using the "Thunderbolt" design from our Links page. The Hypertrike project will (if it succeeds) greatly increase the number of velomobile type personal transport vehicles in everyday use by creating a design and constuction method that is easily copied by individuals using commonly available materials and skills. Send me a message, trev at hypertrike dot org to join the que for free use of the moulds and make a set of body panels of your own. So that your important message doesn't get swamped by spam, there is no hyperlink so you must type in the mail address manually, with no spaces and substituting punctuation symbols '@' and '.' in place of words like "at" and "dot". If that's all too much, just use nospam@hypertrike.org and hope that your message is not swamped with spam! A discussion thread is running at WA HPV Homebuilders Forum. Have your say, leave me a message and join in! 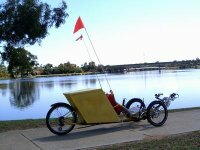 I decided to support my local HPV builder, Logo Trikes but if you have no one in your area and don't want to freight one in, a free set of plans to build a recumbent trike is at the International Human Powered Vehicle Association. While researching possible designs for a Hypertrike I met Dr Pat Howden who kindly offered the electronic version of his book which is jam packed with ideas and designs for living an extremely low cost, sustainable life. Get it here! How to Live - Free at Last. "Proof of Concept" only version of a Hypertrike - rear lockable luggage space but minimal aerodynamics and no lockable cockpit space. This page was last edited 10 April 2009. "TREV" is a two seat electric car with tadpole wheel layout. See News for details. Hypertrike Use Accelerates Fat Loss? Failed weld joint on wireframe master shape is a setback for the Hypertrike body shell. See News for details.